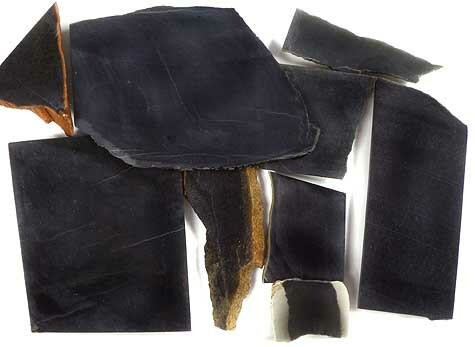 Edwards Black Nephrite Jade is from Wyoming and was mined out neary 50 years ago. We obtained some slabs in a trade about 20 years ago and just recently extracted them from our "archives". Edwards is known for it's relative ease in polishing (for nephrite) and ranges from dead black to a slightly mottled black to very dark gray. This material will cut highly coveted Edwards Black Jade gems. Jade has been revered for thousands of years in both the Orient and the New World. Although jade has a reputation of being hard to polish, this material will polish well with diamond and takes a very high polish with chrome oxide.